“Because what the Borg have done here in 'Descent' is, terrifyingly, assimilate the very concepts of individual positionality and human empathy themselves. They've taken two of the most sacred tenets by which Star Trek operates, ground them into the engines of capitalism and turned them back against us in an attempt to quell any resistance we could offer before we reached a point where we were prepared to effect change. It's hard not to go into “Descent, Part II” without acknowledging that this is the beginning of the end for Star Trek: The Next Generation's televisual voyage. The news had broken over the summer, so there's no point in pretending the shadow of cancellation wasn't looming long over the seventh season. Let's clarify a few facts first and foremost then: Yes, Star Trek: The Next Generation was prematurely canceled. Yes, it was canceled because Paramount wanted to launch a film series with the Next Generation cast. Production costs had gone up and, with the show as popular as it had ever been, they thought it would be more profitable to start a new film series than to continue the TV one. They were wrong. Everyone in the cast and crew wanted to keep going, and the actors were in fact *contracted* for more seasons: All that talk of the show being “tired” and “out of ideas” only happened suspiciously after the fact, and suspiciously came mostly from Ron Moore. Yes, Star Trek: Deep Space Nine was always intended to inherit the mantle. No, it wasn't ready to do that in September, 1993. Star Trek: Deep Space Nine was also not performing up to the studio's expectations, which led to Paramount making another decision that was, in hindsight, perhaps ill-advised. This confluence of events and the choices made during them sets in motion a domino effect that will lead directly and inevitably to the death of Star Trek. And this will happen not in 2005 or 2013, but in 1994. But that's a topic for another time someday in the future. The topic tonight is, relatedly, legacies. That of Doctor Soong on Data and Lore, and of the Enterprise, in and out of universe, at large and on me personally. It's also the story the pseudo-sentient metafiction of Star Trek: The Next Generation is telling for itself and for us. “Descent”, like “Time's Arrow” and “Chain of Command” before it, is the show doing a metacommentary on itself and the discourse surrounding it. It's extremely telling that a reoccurring theme throughout Part 2 is trying to parse out precisely what good the Enterprise has accomplished over the course of its voyage. Hugh (who of course has to be here given all the parallels this story has with “I, Borg” even before you get to the continuity references) petulantly demands Worf and Commander Riker justify their existence and prove they aren't doing more harm than good, and Lore succeeds for awhile in convincing Data that his “time aboard the Enterprise has been a waste”. Lore is something slightly different and I'll get to him in time, but it's the Borg here who provide the most immediately direct and obvious challenge. 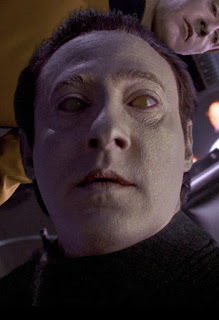 The end result of both their assimilation of empathy and the diegetic and extradiegetic callbacks to “I, Borg” is that the presence of the Borg of “Descent” is meant to invoke grimdark, just as it does in The Worst of Both Worlds. Grimdark is the antithesis of empathy because grimdark is intensely egoistic (and egotistic): It is the adolescent, self-absorbed focus on one's own experiences to the point of near-solipsism; the elevation of the ego to the status of antihero protagonist of a noir tragedy you've penned yourself and that only exists in your own head. And it only makes sense that the Borg would turn to grimdark after assimilating the concept of individuality and self-worth that the Enterprise crew tried to teach Hugh, because grimdark is also fundamentally capitalistic. Because media is a defining force in modern society, and because modern media privileges the targeting of western adolescents and adolescent emotions above all others, grimdark has become profitable and successful to the point of becoming hegemonic: A perfect case study for the Borg in practice. If The Worst of Both Worlds was a statement of purpose, than “Descent” is Star Trek: The Next Generation rising to the challenge once more. The Borg serve Data the classic grimdark false binary: The only way to truly become enlightened is to leave empathy, optimism and utopianism behind and focus solely on the negative. Positivity is the recluse of children, the non-rational and the non-enlightened. And, buying our product, at the low price of your loyalty and subservience to our authority, will set you free and allow you to flaunt your newfound wealth enlightenment in front of your peers. Even Lore's justification of his behaviour, which Data internalizes, comes out of the grimdark realpolitiking argument that everything has to be done in service to “the greater good”. Sacrifices have to be made. Wake up, sheeple. But that's what leads him to commit acts of unspeakable evil. Hugh's critique of the Enterprise crew is to-the-letter grimdark, and he's absolutely, positively, definitively proven wrong. Frankly, I was stunned to see that from this creative team. And it's among this backdrop that Lore's rise to power becomes not just logical but inevitable. “Descent” finally reveals to us all what Lore truly represents in the narrative of Star Trek: The Next Generation. He's a fascist, a racial purist and a eugenicist. Of course he is, because he's the product of those selfsame concepts who has internalized them into a worldview he projects outward through his actions. Lore isn't working towards anything with the Borg that Doctor Soong himself didn't work towards with Data and Lore: He wants to engineer a Master Race around his notions of biological perfection which, due to his extreme interiority, come out of his own sense of self-image. Which is why Lore's runaway id complex is a natural fit for the Borg, because both he and they come out of Star Trek's unspeakable past that it is constantly in danger of repeating. Not only are fascism, eugenics and capitalism the skeletons in Star Trek's closet, they are also the dark ideals aspired to by all destructive impulses and energies in the real world: Terrorists who start mass shootings because the fancy themselves the antihero protagonist of a grimdark action movie. Fundamentalists who believe anyone who looks and thinks differently from them should be bred, indoctrinated or genocidally purged out of existence. Elite liberal technoscientists who talk of “wasted human potential”, preach the coming of a messianic artificial technological singularity and who live in constant irritation at those they perceive as less intelligent and enlightened then them pleading that if “just the right person” was an absolute dictator the world would be a much better place. Precisely the sort of person who would appoint Lore their fuhrer in their perceived time of need. This is the world Star Trek: The Next Generation foresaw and feared, and this is the world it's meant to counteract. That's its legacy, and if it's going to be judged as a success or failure it ought to be judged on its own terms. “Descent, Part II” is one of the most iconic episodes in the series for me. I've always vividly remembered Data's climactic showdown with Lore, and the final scene where he deactivates and disassembles him. It happens differently than I remember: Although I definitely remember the scene of Lore's head on the floor, I also remember (in practice incorrectly so) that their final confrontation took place in a darkened corridor and that Data took Lore apart on the spot, putting his parts away in a drawer. In hindsight, I think I've conflated parts of this episode with parts of “Datalore”, which I guess is appropriate. This time around I also noticed some structural problems: The entire episode is basically a series of captures and escapes, although I was pleased to see that Beverly's stint as acting captain and her gambit with the sun's corona and the solar prominence was every bit as badass as I remembered. So many more of my most formative memories of Star Trek: The Next Generation lie ahead. This doesn't feel like a show on its way out. This feels like a show at its creative pinnacle. although I was pleased to see that Beverly's stint as acting captain and her gambit with the sun's corona and the solar prominence was every bit as badass as I remembered. This is one of the big things I remember from this episode since it was a direct reference to a specific plot event in a previous non-"event" episode. That sort of thing wasn't really "done" in 1993, so far as I remember. It was a little strange, as I recall, as though the dialog was uncomfortable with relying on the audience's memory. Also, there's the fact that, in a very material sense, the Dominion War would not have happened had Star Trek: The Next Generation stayed on the air. I rewatched this a couple of weeks ago, and I thought tehy actually did a good job of making the "hey, audience, remember this?" seem natural--Crusher is the only person on the bridge who was in the prior episode, and in about two sentences she tells the two crewmembers she's working with everything they (and the audience) need to know. Also, I really liked those two crewmembers and their interactions. I wish they'd brought them back, maybe in "Lower Decks" or something. I think maybe I didn't click in on the fact that she was the only one who'd been around for the prior episode, so I was wrapped up in the fact that the mode of her exposition wasn't markedly different from when they introduce a previously-unmentioned offscreen-backstory. Yep the Dominion War - I am actually looking forwards to that section in your analysis, not because I like the war (I missed most of due to my own boredom with it when it aired in the UK), but just that it will be interesting to be looking at it with fresh eyes. "Grimdark is the antithesis of empathy because grimdark is intensely egoistic (and egotistic): It is the adolescent, self-absorbed focus on one's own experiences to the point of near-solipsism; the elevation of the ego to the status of antihero protagonist of a noir tragedy you've penned yourself and that only exists in your own head. And it only makes sense that the Borg would turn to grimdark after assimilating the concept of individuality and self-worth that the Enterprise crew tried to teach Hugh, because grimdark is also fundamentally capitalistic. Because media is a defining force in modern society, and because modern media privileges the targeting of western adolescents and adolescent emotions above all others, grimdark has become profitable and successful to the point of becoming hegemonic: A perfect case study for the Borg in practice." Man Josh, this is so much of why I love your blog. This and so much of what follows in the article is simply brilliant. I have always loved Descent and what it represented - "Grimdark is the antithesis of empathy" - oh hell yes. The paragraph where you describe the actions of terrorists, fundamentalists and technoscientists is a perfect summation of the anti-empathy forces in our world. Thanks Josh for a great piece.